Chimney Rock State Park, in Hickory Nut Gap Gorge, is a favorite North Carolina outdoor destination with excellent family hiking, beginner to advanced climbing, and peerless views of the surrounding area. 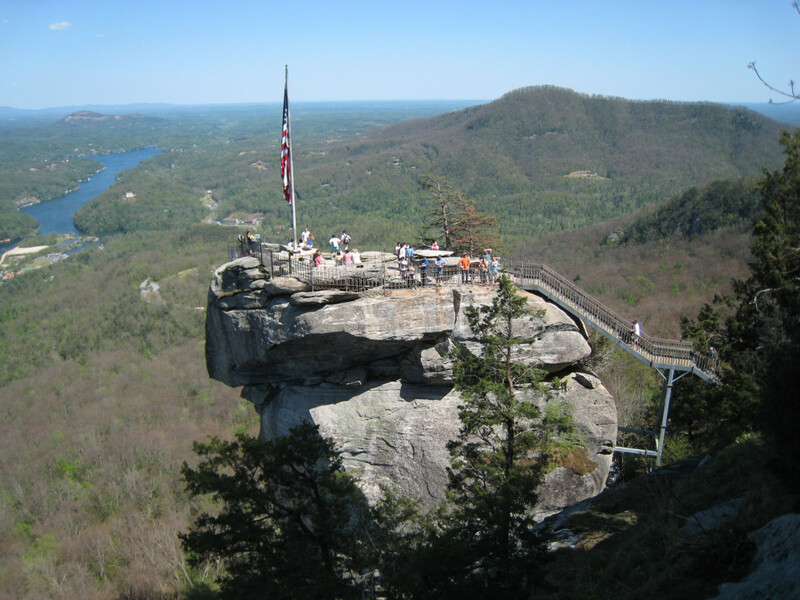 Chimney Rock State Park is one of the most iconic outdoor destinations in the state of North Carolina. From the top of the ancient rock face for which the park is named, visitors can witness amazing views of Lake Lure and the sweeping valley below, and there are also plenty of recreational opportunities, ranging from hiking to rock climbing. As for hiking, there are a number of excellent trails in the park. The wildly popular Outcroppings takes hikers up a challenging 26 story staircase to Chimney Rock. 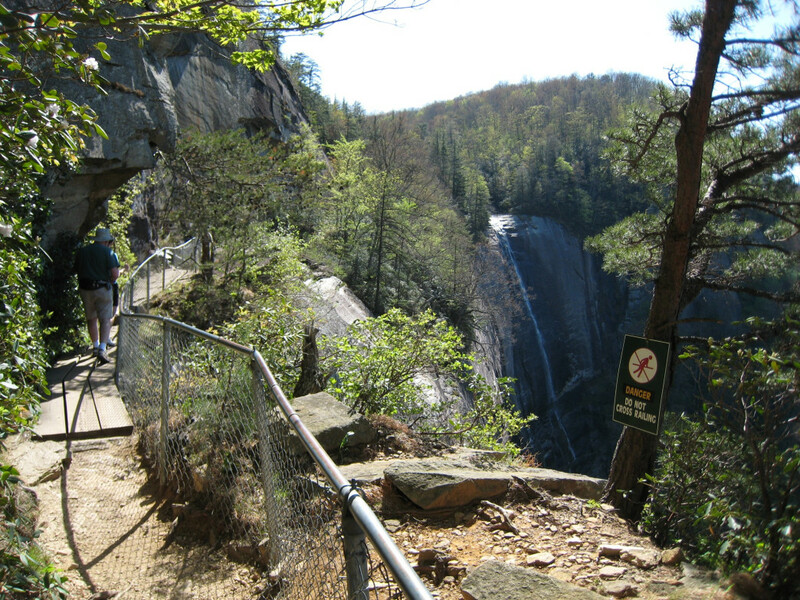 The Hickory Nut Falls Trails leads to an impressive 400-foot tall waterfall. And the Skyline Trail leads to Exclamation Point, which is the highest point in the park. Not only is Chimney Rock known for its wonderful family hiking opportunities, but it also offers excellent climbing, for everyone from beginners to more advanced mountaineers. On sheer rock faces with long range views of the Hickory Nut Gap Gorge, anyone from 6 year old children to 60 year old seniors can enjoy top-roping these single and multi-pitch climbs for a fee that is pretty minimal. The park's instructional partners, Fox Mountain Guides, are great at what they do, supplying climbers with all the equipment and requisite knowledge and support needed to have a successful day on the rock. For beginners, there is a 60-100' route that is single pitch and features good holds. Once to the top, climbers can rappel down for a just reward. Intermediate and slightly more advanced climbers have the option of a multi-pitch route where an instructor will lead, place bolts and anchors, and belay from above. This route is closer to the 200-400' range. There are climbing routes for everyone from beginners to more advanced mountaineers. If top-roping isn't your thing, experienced climbers can bring their own equipment and use the non-fee access to Rumbling Bald and its massive boulder field (with roughly 1500 boulders and some of the best routes in the southeast, if not the entire country). Chimney Rock State Park is located at 431 Main St. in Chimney Rock, NC 28720.